Due to the large number of requests and the huge amount of information on this page it is being divided into three different sites. If someone is interested in the latest questions and answers they will find them on page three. This page is the beginning of the Ask John Brzenk series. John is recognized as the best armwrestler in the history of the sport. No more questions will be accepted. John has contributed years answering questions which you will find on these three sites. Question #1. Dear John - I have heard about you for many years but have never seen you compete. How many years have you been in the sport? Ive been pulling at organized tournaments since age 17 and originally started in the Midwest area. Im currently 33 years old and will turn 34 on July 15th. 3. How many 1st places have you taken? ..and of course all were not first place. To answer your question though I would say around 150 to 200 tournaments. I think more people will have the opportunity to see the 2 minute video if they can access it live rather than taking the space and time of downloading. Yes, numerous times, although not recently. We have probably pulled 30 to 40 times against each other in competitions through out the years. 1. Is weight training important and if so what does he advise and how many times a week? 2. Why did you lose the match to Gary Goodridge in yukon jack 94? Because the rules state when your arm touches the pinning pad you lose....That and the fact that Gary Goodridge is one of the best, if not currently the best heavyweight armwrestler out there. As I remember it he had better back pressure than I did that day which was something I never expected from Gary , he was always great in a hook and his press isn't bad either, although this new found technique will make beating him very difficult. Its always much easier to beat someone when you know which direction their pulling. When there is uncertainty it makes winning much more difficult. 1. Other than armwrestling, how did you develop your side pressure so well? Did the steel bar bending competitions help you, or do you do any other training exercises that you think helped? Other than armwrestling? Armwrestling is what does it ! Its very hard to simulate the pressure needed for great side pressure by lifting, or any other simulated attempt. Plus for me the competition, even practice makes me pull the muscles and tendons more than I ever would working out by myself....plus it makes working out a lot more enjoyable.Steel bar bending competitions? I'm not familiar with that. a lot of others suffering from the same condition. Any suggestions? Your forearm and wrist look very impressive in the photo you have provided on the Internet. Do you recommend any exercises for that, or you are a "natural" ? Any other suggestions for training to become a good armwrestler? Is my forearm natural? Maybe a little, although my left forearm is about 2 inches smaller than the right so armwrestling has had a little bit of an effect on it. As far as advise. Armwrestle, have fun, and be patient it takes some time to develop. 1. Dear John, imagine there is a guy whom you don't know very well. It's up to you guys to pull now, on a tournament. But you really don't know how he's gonna pull, I mean, what technique this guy's gonna use. How would you pull? Which particular technique or move would you perform? 2. Is it always useful and suitable to use the Top-Roll, let's say one's really good at it; strong wrist/ effective poste/ strong fingers and so on? 1. If it's in a tournament. I would watch to see what he likes to do. You can also get a pretty good idea what his strong points may be by his build. Which technique is the right technique? This depends on your strong points and his weaknesses. 2. Is the top roll the best technique for you? Maybe. But eventually you will run into someone that has to be beat with a good hook. Be well rounded it makes your best move even better when your opponents are a little unsure which direction your pulling Don't give yourself away setting up at the table. Become a unpredictable armwrestler. It also helps slow down the hits from your opponents. 1. 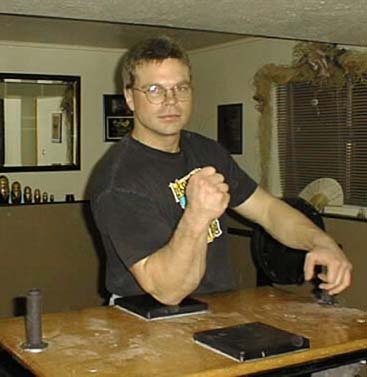 John, in your opinion what are the top 3 best armwrestling exercises? 2. Also do you have to diet to make the 198 class? p.s. I enjoyed watching you in person at Petaluma 96 and would have really liked to have seen you defend your title in 97 at Petaluma against Jason Vale & Eric Woelful. I'm not sure there are certain exercises that are better than others. Certainly the hand and wrist are one of the most important first steps in becoming a good armwrestler....But from there a lot would depend on the style that your working on. Personally my back, shoulder, and triceps (especially the side triceps) seem to bother me the most from pulling hard so I try to reinforce those areas in my work outs. Funny as it may seem the styles that I use most never seem to bother my biceps although I do work them, they seem to be plenty strong enough compared to my other weak links.. 200 lbs has not been much of an effort for me to maintain in fact I think its my natural weight when I'm not working out hard. 190 lbs is reachable for me with enough notice without too much strength lose. Although when I go on my small weight lifting kicks I have been as high as 220 lbs. I feel most comfortable around 200 in my every day activities, although I do notice a difference in my armwrestling strength when I am heavier. Well we all know that John is one of the best. But when can we expect to see him next, and where? I know many people look forward for the chance to be able to pull against him, and I think if they knew where and when he was going to pull next then with this information we would be able to make that tournament all that much better!
. If its a sponsored pro tournament you will most likely see me there.... Currently I plan on attending March 1st main event tournament 220 lbs class. The Golden Bear in Moscow in April 98 Super heavyweight class. The AWI Super Heavyweight tournament in Las Vegas June of 98. Then the 98 Pro Am at Lake Tahoe in June. 1. I was writing to you to see if you had any videos or books available on the sport of arm wrestling. I am a newcomer to the sport. I used to be a competitive powerlifter and I love arm wrestling and would be very interested in learning the technique as well as the strength training side of this sport. 2. Also, what is the best publication to get on the sport as far as schedules and tournaments are concerned? I'd really be interested in obtaining information that you have personally written or been involved in. .and who knows maybe eventually with local cooperation we can have tournament schedules posted by the different areas of the country. How does one go about learning arm wrestling? A few years ago I won a local arm-wrestling tournament just as a goof, beating several bigger and stronger guys, so I obviously have some "knack" for it. I weight train regularly, and have powerlifted successfully in competition for some time, but would like to start competitive arm wrestling and would like to learn the technique and training from someone. I have watched numerous matches on TV and can obviously tell that technique beats strength every time. Who can I learn from? I currently live in Denver, Co. Thanks for any help you can give. The best way to learn how to armwrestle is to compete first at a local event like you mentioned talk with some of your competition see if they have regular practices tell them you are interested in learning and would like to be a part of their training. Technique is important but believe me your arm requires a lot of strength and stability to be able to execute technique. There is no secret trick to armwrestling. It comes from a lot of armwrerstling and a lot of reinforcement in some very unnatural areas. Dont be discouraged as it will take several years of armwrestling before you realize your potential. Could you please tell us a little about your three best matches. Thank You. 1. The Sands Reno tournament, back in around 82 or 83, was something very special for me. My father was still actively pulling then, I was 19 or so, virtually an unknown, and pulled three weight classes that day. Beating some current legends of the time, which included Johnny Walker, Virgil Arciero, and Clay Rosencrans. I did however, fall short of winning all three classes, taking a second to Mike Shadock in the heavyweight class. It still was a great day for me. I'd also like to mention, after that tournament, it took me almost 4 years and a lot of matches to beat Johnny Walker again. Reno must of woke him up a little. Any time I beat Johnny, I felt like I accomplished something. Next to my father, Johnny was my inspiration for excelling in armwrestling. Hated to see him retire. 2. 1986 Over The Top tournament. Lots of hype, high stakes, and length made this tournament very memorable for me. At 6:00am in the morning I pulled Ed Arnold for the biggest prize in armwrestling to date a Volvo White Semi Truck. We started three separate times, in a match that seemed to last an eternity. I was sick for days after that tournament. I think mainly from lack of sleep. But it was definitely worth it. 3. 1988 World Wristwrestling Championships. This tournament at the time was single elimination it had some great pullers but the final three matches are what I remember most...Semi finals in the heavyweight class paired me up with 300lbs plus Richard Lupkus. I don't think many got a chance to pull Richard but I can tell you he has to be the strongest arm I have ever gripped up against. Raw Power. If it wasn't for the limited movement on the wristwrestling table and his inexperience. I surely wouldn't have lasted long. I did however battle back and win....but the tournament wasn't over I had Ron Bath next in the middle finals then Robert Webb in the heavy finals. My match with Robert has to be the longest and hardest fought match I have ever been involved in. You'd better have lots of endurance when pulling on the old wristwrestling table. Hated to see it go .... not really. Hey John, after a tournament I suffer for week's in my upper shoulder. What exercise or pulling style will help? Are you talking about the back part of your shoulder or deltoid. I suffer there also. I do several shoulder exercises which includes concentrating on the deltoids...As you become more advanced in armwrestling it seems more and more strange muscles start hurting......I think this is normal? 1. First, feats of strength: What are your best feats of strength with arm and forearm exercises? Table curl? Dumbbell wrist curl? E-Z Bar curl? Concentration curl? Alternate dumbbell curl? Others? 2. Secondly, I am interesting in hearing some of the most impressive feats of arm strength you have seen others do -- or that you are aware of. While strength in the gym doesn't necessarily translate to success in competition, there seems to be a positive correlation between the two, albeit, a non-linear one. I haven't seen any weightlifting from any armwrestlers that would probably impress a dedicated weight lifter. If weightlifting consisted of locking out statically an enormous amount of weight then maybe armwrestlers would be more impressive in the gym. John first of all I would like to say that I have watched you for years and in my opinion you are the best pound for pound armwrestler ever. I have watched you pull on TV and tapes and you never seem to lose your hand. There are a lot of armwrestlers that have been pulling as long as you but never seem to develop that type of hand strength. Do you do any type of exercises that after you do them for awhile and compete in a tournament you know that they made a difference. I have to attribute my hand strength from simply armwrestling a lot. I do some wristcurls and hand grippers occasionally but I really don't think its as effective as just getting into some hard finger, top rolling matches. I've just recently started pulling more with my left arm, and although I've always used both when working with weights and gripping devices. My left forearm is 2 inches smaller than the right? That says something for the effectiveness of armwrestling. Strong biceps or strong wrists..what's better? Developing strong hands and wrist are the first steps and most important thing in becoming a good armwrestler without them you cant begin to use your upper arm strength to move towards the pad. I also believe the forearm muscles play a much more important roll in keeping your arm locked than the biceps do...in my opinion triceps are more important along with shoulders and back. Biceps although they look intimidating are way down on my list for main muscles used in armwrestling. Hi John, You mentioned that you had competed against Gary Goodridge about 30-40 times. What percentage of those matches did you win? I've had some great matches with Gary through out the years I've won my share and lost a few trying. The question is how would we fair against each other today? What you did in the past is soon forgotten . The mental advantage comes from your last meeting , which I hate to say is in Garys favor. Gary has been a great competitor through out the years and I look forward to testing his abilities again in the future. Its been over three years since we have pulled against each other? Someone please hold a heavyweight tournament. I love that "streaming video" of you and Zaur. I have watched it about a dozen times. Was this your first match against him? Was the Russian tournament "Gold Bear" a single elimination or did you beat him twice? Had you heard of him before you went to Moscow? Yes it was the first time I had met and competed with Zaur, and no I hadn't heard of him until that time. The tournament was double elimination until the finals. Then it became single so I only competed against him once that day. John I noticed that the table your standing at doesn't have the pin pads. Do you practice on a table like this to give yourself power beyond the pad or basically a greater range of motion or is it just a unfinished table? Actually that photo is taken at my little brothers house. Its Bills table and I'm not sure why he never put pinning pads on it. But I do like it without the pads it makes the pulls a little harder and longer. Say you know a guy hooks do you top roll him and vise versa? Also I have problems with opponents with higher forearms than my own. Do you do anything different in this situation? Also that picture you have posted shows a large forearm have you ever measured it? Sure, if you can why not. What ever works and is easiest on your arm. Each person and situation is unique that is why there is no substitute for experience and being able to use different techniques. Long forearms means less leverage in a hook try controlling this person into a hook to see how he feels. Grip hand high then low on the wrist to see if it makes a difference. The last time I checked my forearm measures 15 1/2 inches with arm fully extended. Question for John: Could you please give me a technical explanation on how to execute the top roll? The term, to top roll someone, means to gain a leverage advantage by positioning your opponents hand in a opened hand position. There are several different ways to accomplish this. First with arm strength. With your wrist positioned straight curl like a reverse curl straight back towards your body with the knuckles of your fingers positioned high towards the ceiling. This type top roll requires a lot of curling arm strength and not as much hand and wrist strength. Its a good style to work on if your not blessed with large dominate hands and wrist. The other type of top roll relies on superior hand strength along with good side pressure. This top roll doesn't relay on the biceps as much as it does good hand wrist and finger pressure. The first step in this move is protecting your own wrist by getting a bow in your wrist. The rolling and side pressure into your opponents fingers should be felt with the meaty part of your own thumb. The outside hit relays more on triceps back and shoulder along with a dominate hand to control your opponents hand open to the side. Two good top rollers in this direction commonly results in a slipped grip and strap. PS: I saw the video of you and the guy from Georgia and there is a part where he put his whole bodyweight onto his arm and almost gets you over, is that allowed?? It sure is. As long as your body, shoulder, face, etc dose not come in contact with your hand. The move you saw was what armwrestlers call a shoulder roll. You position your body behind your arm and press with all your body weight. This isn't as easy as it looks it requires a lot of tricep arm strength to keep your arm in front of you. It is also difficult to protect your hand and wrist from being top rolled. Hi John, first let me tell you that I am a big fan of yours, not only for your known ability to pull but also for your good attitude on a table. I am one of the best friends of Marc Gauthier (maggo) from Quebec Canada. You might remember seeing me with him because I use to follow him to all the tournaments. I say I use to, because I moved from Canada to Southern California 7 months ago and lost track of him. I consider myself the biggest fan of armwrestling, even though I am not an armwrestler myself. Now my question is, what is your opinion as far as warming up is concerned before a competition? Over the past years I have had many discussions about this with a lot of armwrestlers, and no one seems to agree on what to do to warm up before a competition. Im sure warming up is the safe thing to do, and I always do this before practice. But for a tournament when I need to perform at my very best. I dont. I have tried warming up and it hurts my performance even the pump you get from mentally psyching yourself up has hurt . If stiff I will stretch chest and shoulders but I never warm up the arm and hand any extra blood there definitely takes away from my hand strength and endurance. This also includes pre tournament arm rub downs. This may not hold true for everyone but it is what Ive found works best for me. The above question posted is on warming up and I was also curious about what you do after a tournament. Do you go straight for the ice whether you feel you did any damage or not or do you wait and see how your arm is doing? And are there things that you have found over the years that help you recuperate quicker? If ice is available I will use it during and after a tough tournament or workout. Ice during a tournament with hard matches left might not be the safe thing to do as far as injuries are concerned, (though Ive never pulled a muscle in my hand or forearm), it is definitely an effective way to get the feeling back in a dead pumped up arm. I will normally apply ice to my forearm and hand but have occasionally applied it to sore triceps. As far as quick recuperation techniques I dont have any. I do ice my tendons during the week to 2 week period before a big tournament this mainly is a mental thing that I do to make sure my tendons are not inflamed before a big match. Can you give me some advice that would help me get better balance at the table. I find because of not being able to use my paralyzed left arm to hang onto a peg at the table it is very hard to keep my balance when a competitor hits off the "Go". I find that I always have to start defensively and try to catch the "Hit" rather than being the aggressor giving the hit. I find it very hard in a deep hook situation because I cannot pull across my chest due to having nothing there to help me (my arm). Maybe you could practice this at the table using just one arm to give me an idea of some counter moves I could use or your insight as to a way of keeping my balance at the table. I've tried different styles using the peg and not using the peg, and I've found that I personally don't pull on the peg unless I'm in a shoulder roll move. I can't explain what your experiencing. I personally know its very difficult to move your body weight around with the limited movement caused by having your arm positioned in front of your body such as the old wristwrestling style and with this table I would adjust by pulling back harder than on a conventional table. Try moving your stance to different locations for balance problems. Your habits might not necessarily be right for you give new positions and styles time to develop. If you find you are catching your opponent a lot try developing more back pressure to keep your hand from being rotated to the hook position. I have heard you on more than one occasion say that you've gotten stronger through the years predominantly from table workouts. How often do you pull in a week? Who do you pull with? How do you deal with the fact that whoever you pull with will probably be weaker than you? How does that "push" you to be better and stronger? What exactly do you do during those table sessions and for how long? When I first started pulling at age 13 I would pull every day. This was enough recoup time for me at that age and I improved steadily without to much injury. As I got better and older I steadily decreased my workout pulling sessions to once a week I have tried working out more than that but felt I was causing injury. Ive pulled with hundreds of guys through out the years but currently pull with about a dozen local guys along with my brother Bill. We will pull on average about an hour to maybe 2 on various different styles. With a dozen good seasoned armwrestlers to pull with. Being the strongest soon doesnt matter with a few hard pulls under your belt you soon struggle just to stay in the match getting a good workout has never been hard for me no matter who Im puling with. Motivation recently has been difficult But with some big tournaments on the horizon It gets me excited. I dont think Ill ever give it up. Its been my life and I love the sport. John, First, Have you ever heard of a magazine called "Armsport" ? If so, does it have a lot of good armwrestling tips (like Milo does). Also, where can I find some good Armwrestling videos, for both entertainment and to learn? And last, have you ever tried the Iron Mind Grippers? Do you think that they are a good training tool for armwrestlers? On the off note I would just like to say that ever since I saw a Yukon Jack Tour. on ESPN 2, I've been hooked. I believe that with guys like YOU, armwrestling will soon be bigger than ever. Thanks for taking the time. Your questions and answer page is GREAT!!!!! I received Armsport for its first couple of years. I havent gotten it in a year so I cant comment on the progress or articles in it. I was told it has a new editor and will show improvement with more and more support. As far as good videos Im at a loss for recommendations the videos I own are ones that I have personally taped. There great for getting you motivated to work out. I have tried the Iron Mind Grippers but do not currently own one. I do however use the weaker handgrippers on a daily bases and do think they help. Dear John, my dad used to be an armwrestler. You might know him. Mike Kuba. I looked up to him a lot for armwrestling. I thought it was the coolest thing in the world. I want to know if you consider yourself a roll model to any younger people. Sure I know your dad. He is someone I personally looked up to and respected when I first started pulling. He has a great shoulder roll press and was always great to be around. As for your question about being a good roll model Im not sure what that means. I dont spend a lot of time with kids teaching armwrestling, the tournaments I normally attend dont have the younger generation watching. Ive never been embarrassed by any of my actions on or off of the table. You could consider me a G rated armwrestler . My question might seem somewhat odd but I think some people might be interested in your "presence". I find that your professional, clean cut appearance is in some way even more intimidating than a 350 lb. "maddog" fully tattooed biker armwrestler. You always seem so relaxed and poised that it makes it seem like there is this incredibly powerful presence you have harnessed. From the matches I have seen you in, you don't ever growl or contort your face. You just grip the opponents hand and get to work methodically overpowering him. My question is, is this something that you consciously do to reverse-psyche your opponents or is it just your mannerisms and who you are? My calm approach comes from both my personality and from experience. I have tried different approaches psycheing myself up and being aggressive on the table and it has hurt my performance more than its every helped. I personally perform better on the table or in the gym lifting weights with a calm concentrated effort on strictly the group of muscles that are required. Who am I? I am a guy who is blessed with good genetics and a dad who loved the sport. I was brought up armwrestling at a very young age and have never stopped trying to improve. With tournaments like the Main Event which gets young kids involved I am afraid your going to see a lot more (Tiger Woods) in the armwrestling field. In your opinion who are the three or four best armwrestlers around in the lighter weight classes (under 175 lbs.)? Also, your arms look huge in the photo--how big are your forearm and biceps flexed and how big is your wrist? This question is a tough one. I'm sure there are plenty of good 175 lb guys out there that have beaten or think they can beat the guys that I will mention. My list is from years of watching and occasionally armwrestling each of these great armwrestlers. All of them have had there bad days with occasional injuries that have set them back. They have been around a long time and consistently have won major tournaments over the years. These armwrestlers are all from the U.S. I don't have experience with the quality of the wrestlers in some of the other countries. If you beat one of these armwrestlers you have something to be proud of because it doesn't happen very often. Bicep is 18 inches largest its ever been. Wrist a little under 8 inches. Can you be more specific on the particular exercises you train for armwrestling? You only mention some vague body parts, but not the exercises themselves. I would really like to hear the particular exercises and number of sets, reps and #days. I am fairly new to pulling and I would really like to get some solid advice from an experienced and successful armwrestler like yourself. This kind of information is not readily available and know one seems to want to share it either. Thanks in advance for the information. After competing for many years, you have probably seen lots of injuries (broken arms specifically). What are the chances of a person returning to competition after receiving a break (spiral fracture of the humorous) and having a steel plate used to correct it (plate still in)? Doctors seem to never give an answer due to the fact that most of them have never treated someone who wants to return after this type of injury. To be honest over the last 15 years of armwrestling Ive seen maybe a handful of broken arms and all of them in the upper arm. (Except for my own which was in the elbow.) To answer your question I think it would depend on the individual. How old are you? How bad do you want to pull, and are you mentally ready to go through the pain and uncertainty that goes along with developing the muscles, tendons,and (bone) for armwrestling. The few people that I know that have injured there arm in this area have trained hard and have become good armwrestlers. A current friend that works out with us, Robert Baxter, broke his arm about 3 years ago. Im not sure how bad it was compared with yours but his included much nerve damage... he just recently won the amateur 220 lb class at the Main Event tournament and is improving with every workout. Take it slow and see how it feels you can get a good workout without twisting the upper arm to its limit. Over time stressing this area will surely strengthen it and build confidence. The danger of a break seems to diminish with time thats why I recommend taking it slow at first until your arm gets accustomed to the torque. I have been searching all over the web trying to find out what muscles are involved in armwrestling and haven't found a thing. I obviously don't know a thing about the sport, but I find a great interest in it. If you could give me the information, I would greatly appreciate it. I'm not familiar with all the muscles of the body. But I can tell you there are a lot involved when armwrestling. Depending on the style some maybe more important than others. The hand and wrist for starters is very important. From there it requires years of developing the tendons and muscles on the inside of the elbow. (armwrestling puts a tremendous strain on this point and it takes years to develop this area). This is just the beginning though from there you'll develop biceps, triceps, shoulder, back / lats and chest. You will find as you reinforce certain areas it will cause greater strain on other areas, areas you never felt before. The best way to see what muscles are used and to develop these muscles is to get involved and try it out, be patient though it takes the body some time to adjust to the unusual strain. If you are a heavy weightlifter don't be discouraged armwrestling has some unique areas that require some extra time to develop. John so much is put on the hand in armwrestling, my question is, is it possible to be one of the best in the world in say the middle weight and heavier class with a average to below average hand size. It seems that when you go up against a person with a large hand that they are starting out with a advantage from the get go.. If you know of anyone that has made it to the upper level please tell us who they are. And also what is the size of your hand..
requires good wrist curl strength with superior side pressure. Avoid grabbing your opponent hand to hand but instead grab a little lower on the wrist. If your hand strength is efficient enough this will force them to beat you with there arm strength instead of putting your hand out of position. If hand size and strength was everything Cleve Dean would still be undefeated. In armwrestling there always seems to be weaknesses in everyone. The key is experience and in finding out what those weaknesses are. Different builds make it impossible for anyone to be the best in all areas. pulled and would label them as consistently top armwrestlers. Light weights. Dave Patton. Alan Fisher. Andrew Rhodes. Middleweights. John Walker (retired). Bill Brzenk. Heavyweights. Gary Goodridge (Canada). Cleve Dean (retired). Richard Lupkus (retired). Ron Bath. Jerry Cadorette. I have always been a strong guy but never decided where to put my strength. About a year ago I started armwrestling seriously and am now bringing home trophies from every tournament I enter. My power is great but my speed needs a lot of work. In your opinion, what is the best way to work on speed? I do get a lot of table time in already. Why do you feel you need to work on your speed? Are you getting out of position after the go. Do you find you are catching your opponents? Is your hand being top rolled or controlled in an uncomfortable position or are you just a little unsure which direction to go? Beating your opponents as fast and as easily as possible is the name of the game in staying fresh for the next match. Having a good solid confident start definitely is important. But speed has not been as important for me as having good hand and wrist control. All the speed in the world is useless with out this. Concentration should be focused on achieving good hand position and control. Moving fast to gain position or moving to the pinning pad sometimes can backfire. Once hand control is achieved then you are in control to hit as hard and as fast as you can to the pad. This doesn't necessarily have to occur right after the referee says go.. I can think of a few armwrestlers were it was advantageous to let them hit first putting there body slightly out of position before making a move to the pad. Develop your hand strength and some back pressure this might help in feeling more confident to make a hard move after the go. As far as developing speed I don't personally work on it....I think what your doing is what I would, and have done, and that is build confidence by ARMWRESTLING. One more... Ever pulled Mike Gould? He is the reigning Canadian heavyweight champ. Also, if you are ever in any tournaments near Manitoba send me an email. I would love to watch you pull... or maybe even pull you. I'm sorry Ryan I don't think I have pulled Mike Gould. But thanks for the warning I will try to remember the name....In the past some of the biggest tournaments I have attended have been in Canada. Its been awhile since I've been up that way but would love to have a reason to go there again to pull. John, I am a beginner, who just stared armwrestling last June, and am fascinated with details of technique, especially relating to hand position. My question is, how much can the thumb contribute to the battle for hand position? I wrestle in the 198#'s and have 'largish' hands. They are not long, but rather wide and thick. My fingers are shorter than those of my somewhat ectomorphic training partner (my brother), who is 6 foot, seven inches tall, and who can easily wrap his fingers halfway around the back of my hand, and who has one of the strongest grips of any men I have gripped up against. He used to be able to obtain a wonderful hand advantage over me, with his fingers, until I tried pushing upward with the back of my thumb, prying with my thumbtip against the outside of the first joint (from end) of my pointer finger, and peeling his top fingers open. Is this something you have either tried yourself, encountered with others, or something in which you see much potential? I personally believe the thumb is very important factor in hand strength and positioning for armwrestling Im not sure I fully understand the technique you are using on your brother but I can tell you that I have had soreness in the past with my thumb muscle and it definitely takes away from hand strength and being able to roll into your opponents fingers. Your mention of your brothers large long fingers to me are not as much of an asset as having a thick wide palm. I would imagine at 6 foot 7 he probably has a long forearm which my be a leverage disadvantage. I would approach someone this big one of two different ways. Grip low and force them into a hook where they would be at a disadvantage because of their arm length or by posting straight back with fingers toward the ceiling attacking his fingers which would be lower, parallel to the top of the table because of the forearm length. Trying to defeat him to the side challenging his hand and wrist would be last on techniques to try. And by the way, is there any chance of your coming to the Can-Am Ironman Championships in Vancouver, B.C., in May? Yes, I may try to make the trip for the Vancouver tournament. Depends how much punishment I receive from the Moscow Golden Bear tournament. John, I have two questions concerning Gary Goodridge. Have you seen him lately in ufc competitions? also has your brother bill ever armwrestled him?I haven't seen or heard from Gary in awhile. He called a couple of months ago, and I haven't seen him fight since his match with Don Frye. As far as I know Bill has never locked up with Gary. I have been armwrestling for almost 2 years and I am trying to become as rounded in styles as possible. My question is what styles counter each other. Does a top roll stop a hook and if so which top roll. When do you use a post. And when to use a hook. And when to use the other top roll. This seems to be a easy question but a lot of people have different answers. So I thought I would get the best answer from the best man for the job. And can you tell me why each one counters another. Thank you for your time in this matter as this is surely to help.The answer depends on your strengths and weaknesses. .Along with your opponents strengths and weaknesses. Unlike chess armwrestling requires strength to execute technique. If your opponent is known for having a great hook you definitely would not want to make it easy for him by moving your hand into this position. It will require strength on your part to control the match into a position thats most uncomfortable for your opponent. The question becomes, is your top roll stronger than his hand to keep you from being hooked? As far as the different types of top rolls this also depends a lot on the build and strengths of your opponent. The variations are endless on techniques, experience will help you realize what works and what doesnt It may take a dozen times wrestling someone before you realize how to put this individual into an uncomfortable position. Once exposed its then up to them to strengthen this area of weakness. Does the top roll counter the hook? I personally would try to take advantage of someones hand when being shoulder rolled because I feel that particular move normally weakens the hand and wrist and breaking there wrist back would provide a leverage advantage. But not always. Can someone counter a strong top roller by grabbing a little lower on the wrist and forcing the match into a hook ? Yes, but not always. This would depend on your opponents strengths. Your hand strength and side pressure verses his back pressure and physical build.Every match is unique and two armwrestlers are never exactly the same what works against one person may be completely wrong for someone else. There is no substitute for experience and trial and error. I once asked you for a technical explanation on how to execute the toproll and I would like to thank you as I have now grasped it, your explanation was very good. My question is this...I don't take part in any competitions or anything as there is no official body in Malta, I armwrestle people purely for fun and sometimes as a peaceful way of avoiding a fight (and sometimes to impress a girl). I'm telling you this because most people I pull know little in the way of technique and all of them go for that standard hook kind of position and remain with a solid fist. I am 16 years old so many of the people I find myself pulling are much older and stronger than me... I often find myself on the defensive and win by sheer staying power alone, however this is not always possible because some people are just too strong for me to hold. Do you have any suggestions or tips for me when I find myself in that defensive position of about 45 deg. from the plain of the table and in the hook position? ... I've found that moving my wrist and forcing them into an over the top position tends to confuse them a bit and give me some clearance... however this can work against me as sometimes they can just toproll me... Your observation of putting pressure on the wrist of someone that is not an armwrestler is probably good strategy as most beginners lack the strength in the hand and wrist. The more you continue to wrestle people experienced or just bigger and stronger will eventually lead to more power in your arm, be patient it takes time. Sounds like youve already developed a good lock and at 16 years old some good endurance, maybe not in the position you want, but Im sure it will help in the over all power of your arm. Maybe you should find a training partner that will occasionally allow you to develop strength on the offensive side. Are you pulling on an armwrestling table ? If not you need to construct one. Its difficult for anyone including myself to be offensive from the start in pulling anyone that is halfway strong down without being square on an armwrestling table. John I wanted to know what I can do to train myself to have speed. I have strength but need to work on getting a quick jump. I wrestle both right and left, and train on weights and the table any suggestions would help. Thanks for your time. As long as you are aggressive during practice your speed and confidence should increase with practice. Problems will start for most, including myself, when your practice is slow and deliberate . This type of pulling is great for building strength and getting a good pump for both wrestlers but can sometimes lead to bad habits at tournament time. John, I live in Minnesota and I know Rett Houdek he says he has pulled against you a lot. I consider Rett to be top dog around here. but for me I weigh about 140-142 on average, I've wrestled in Jerry Halversons wristwrestling organization for about 4.5 years but I've never really tried to Armwrestle, I have been told you have to toproll in order to win but I always hook and dive and most of the time it works, but thats with wristwrestling though. I plan on going to Omaha in July for the National Armwrestling. With your experience would you say competition itself is what has taught you your technique? By chance are you gonna be in Omaha? I hope to run into you someday. There are a lot of successful armwrestlers that hook and or shoulder roll I find your comment on diving in on a wristwrestling table kind of funny, for me the only why to win on a wristwrestling table is to top roll first, then to come in with a press. Because of the restricted movement wristwresling requires more arm strength, and a little more endurance, matches are normally a little longer to win. Armwrestling matches normally are a little quicker, and because of the freedom of body movement your lock has to be good. The shoulder roll move may be a little harder to perform because of the spread between the elbow pads. I think you will enjoy armwrestling but the technique is a little different. There is no substitute for experience on the table it builds strength and confidence. I would practice on the armwrestling table as much as possible before your trip to Omaha. Good luck. I may go to Omaha I havent decided yet. Dear John, can you tell us something about the supermatch you had in Russia against this guy who took first? What can you say about him, his technique, style, size, weight and so on? What did you learn out of it? Thank you very much. Congratulations for your first, second and once again second place you took.The guys name is Alan Karaev. He is big, he is strong, he is young, and I'm afraid he is going to get better. Did I learn anything from my match with Alan? A little, although definitely not as much as I would have liked. He has a large hand with a powerful wrist and a good outside hit. His large size my make him susceptible to a posting top roll, which is what I tried during are final match. Or a forced hook, which I wasn't able to perform because of my lack of hand strength. Our first match was in round three. It was not much of a match I tried to control the match inside, he hit hard outside, flattening my hand with plenty of side pressure to beat me. Before our final match I did get a chance to catch my breath and get some feeling back in my arm. I did a little better posting back in the straps, and at one point felt comfortable with my position It is definitely not one of my stronger moves but it was the only option I felt I had at the time. I could tell during our set up that my hand strength wasn't on the same level as his. As far as his arm strength inside it was something I didn't get a chance to test as he controlled the match outside. One of the keys to winning a tournament is knowing your competition and being good enough to stay fresh throughout the tournament, this is something I wasn't able to accomplish. The experience with Alan isn't the only thing that will help my performance the next time we meet. Its also the experience I obtained from pulling the other very capable armwrestlers in that class on Sunday. I look forward to pulling him again along with the other extremely strong armwrestlers that competed Friday Saturday and Sunday. I have 3 little questions for John Brzenk : 1) First Congratulations John (I hope you liked the picture)! (Editors note: Krono is the artist who created the picture of John armwrestling the Bear on the Index page) John Champion in Russia 1990 and John Champion 1998 who's better? (strength, skill, experience, ability)? 2) Watching you win against Zaur in 1990 (http://www.armwrestling.com/video.html) I saw you dominate him since the start of the match, you easily "Played" with his wrist, He seemed a beginner compared to you, but I think you preferred to make a "defensive match", I think you could beat him down in a few seconds if you wanted. Am I right ? 3) The Super-match is a suicide!!! Isn't it dangerous to make a very hard match after a big tournament? Thanks John and Thanks always to Dave. I thought the drawing was great, thanks. As for your first question which John is better 1990 or 1998. Ive evolved into a different armwrestler stronger in some areas weaker in others. For example I think my strength and endurance has improved over the years. I have more experience and Im a little more diversified. The younger John was fearless ready to take on anyone, feeling indestructible and never worrying about injury, the 1990 John was a more aggressive armwrestler with a stronger hit. I think the current John would beat the younger one as long I could stop him for that split second after the go. Your 2nd question. Lets just say Zaur has improved much since are first meeting in 1990. Zaur has great hand strength but still needs to work on his inside strength. You are right. 3rd question. I am traveling 14 hrs to Moscow. To pull only one day, in a match that I was told is going to be a single elimination tournament, against armwrestlers Ive never pulled before? Or pull Friday, Saturday, and Sunday . With no idea who was going to pull and when, I decided it would be best to pull all three days. Suicide? No. A little tougher on the arm? Yes, a little. If I had it to do over again I would still pull all three days. If Sundays ultimate match becomes a big event with a prize that heavily outweighs pulling for the Gold Bear title then I will concentrate on this one day. Although Ive been told by teammates and sponsors that next year I will be attending the Gold Bear tournament pulling only the Sunday ultimate. That sounds good to me. Dear John, Do you think that pulling with cables or rubber tubes is effective in training if a person doesn't always have someone to train with? Or could it help in a persons weak areas by using different angles? Congrats on the Gold Bear tournament. Any chance of you coming to the 98 Worlds in Canada? Would be nice to see you here!Yes I do. Cables and tubes work the arm in a direction that is difficult to simulate with weights. The extra negative pressure that armwrestling provides still works the best. I would love to go to the Worlds in Canada. But these are some of the reasons I wont. Requires time off work to qualify, I think East cost somewhere. I would want to pull the super heavyweight class which I cant make the weight for. The actual tournament takes another full week off work to complete. Weighins, then having to wait 3 or 4 days for the class to actually run. The format for the Worlds makes it very difficult to compete unless you are retired. Have you made any workout changes since your loss at the Russian tournament? Any changes to your actual arm wrestling workouts? I am looking forward to meeting both you and Bill here in Vegas at the AWI tourney. Also looking forward to learning much from both of you at the table. Just hope the arm can stand it! (Editors note: John did not lose at the Gold Bear Tournament - He won the Gold Bear. He did lose in the Super Match which was after the two day tournament. His opponent did not compete in the Gold Bear Tournament and was fresh.) John's answer to the question: To be honest I havent worked out since the Gold Bear tournament. Im taking a small rest from armwrestling. But when I start back up I dont plan to do anything different. I dont plan on attending the Las Vegas tournament. Its one week after Reno Tahoe which I do plan on attending. I work on the weekends so its hard to take off work two weeks in a row. Does the different hand positioning that the AWI uses alter your strategy at all? Do you find it easier to exert back pressure in that position? Is there less strain on your arm in that position?The AWI tournaments in Las Vegas start in the power lock, or wrists bowed and rotated slightly.This does alter strategy. Can you still top roll? Yes. Is it easier? Depends who you are armwrestling? If its someone who has a good posting top roll. Then maybe yes. Is it someone who has a good hook? Then maybe No. One of the things to be concerned with at the AWI tournament is the size of the table as it is much wider than most and the distance from your body to the back of the pad is a greater distance than most tables. This makes it difficult to get close to your arm especially for a shoulder roll move. The distance between the pads is also a little wider so a posting type top roll is also very difficult. The pinning pads are also a little higher than most so a good strong hit to the side usually gives you a win. I personally am more comfortable with my hand being protected by the bow they let you start with. I also like the extra distance this table provides but it takes some time to get used to it. This table is built for someone with a good hooking drag or a powerful rolling top roll. John, I watched your matches on Sunday night in the super heavyweight class in Moscow. 1) What do you think of the guys from Georgia who you matched in the second and fourth round? Which one was better? I remember your Brother Bill won one of them in the worlds 96. 2) What would have happened if Ron Bath, Jerry Cadorette and Gary Goodridge were there on Sunday night? 3) Do you think you can beat Alan inside? 4) Before going to the casino I saw you in the lobby of the hotel and you were drinking some kind of energy stuff. What was it and do you think it helps? 1. Its hard to say who is better I pulled Erekle fresh. Our match virtually killed either one of our chances of winning the tournament. He is extremely strong with a fantastic lock. If the draw for the second round was Alan and myself I believe Erekle could have won Sundays tournament. I would love to see the outcome of Erekle and Alan both fresh.. Erekle is also the one Bill finally beat in 96 after 3 hard pulls. Vakhtang was an easier match for me at the time but I dont know how much was taken out of him by the time we pulled. Its very difficult to gauge how good someone is once the group has had some hard fought matches. 2. They are all in the same league as the wrestlers on Sundays Ultimate. And they all would have had good chances on winning Sundays tournament. 3. I honestly have no idea how strong he is inside. Do I think I can beat him period? Most definitely .Yes. 4. Its a tropical lime drink made by EAS called NeuroGain. I've never been sold on the effectiveness of nutrition. Its been just this last year that I have experimented with supplements and the only one that I can honestly say has made a noticeable difference for me is creatine. Within a months time I gained 20lbs. One of these days I will get a hold of someone that knows nutrition and quit living on junk food. John, When your trying to diet down you take a slow approach instead of trying to cut all the weight in one day, I was just wondering how you cut the weight and then workout or do you cut the workouts out of your routine, do you count the calories or start running more. All your help would be great because I have about ten pounds to loose by the time Lake Tahoe rolls around. I would use a combination of both methods unless you are over weight to begin with. Weight translates to strength. So you want to hit it just right. Diet down slowly and give your body a chance to get used to the new weight to within about 5 lbs of the desired class. This may differ depending on how much water weight you can comfortably drop. Then dehydration before the weigh ins should allow you to hit the desired weight, allowing you to gain a lot of it back before the tournament starts. I personally do not like to run. If I want to make a weight class I will continue to work out but watch the calories. I would never sacrifice muscle weight to make a lower class, your better off pulling your natural weight. Many years ago I wrestled you and Bill in Kansas City, Mo. You were just starting out but even back then you were awesome. By reading some of your fans questions about hooking and top-rolling I can tell them that even when you were a teenager you top-rolled and hooked. I can still remember the coat sleeve that you used on your arm between matches. You were young, gracious, and very talented beating me easily. But I did beat your brother Bill that day as I recall. It is well known that Bill has improved tremendously. John Sr. must be very proud of his boys! Best wishes always!Thank you. John Im sure after all of the years of competing you have taped a lot of tournaments that you have been in and what I was wondering is if you have ever thought of copying these tapes. It would seem to be a good income source and of great interest. And some of your beginning tournaments would also be real sought after. And to see some of the other legends of the sport would be great, the guys that you only hear about from older armwrestlers, it would be a great history lesson. Anyway, I was just curious if you have ever thought of doing anything like this or maybe even a book on the sport.Yes I have competed in a lot of tournaments but have done very little taping. I also would love to see some old footage of tournaments from the past 15 years I'm sure there are plenty scattered around the country. I have some tournaments taped but mainly just the recent 8 years or so. People have given me some tournament footage but a lot are copies of copies and the quality isn't very good. Maybe we should try to get all the armwrestlers out there to send there best footage of some of the Best matches they have in there possession and we could develop such a tape. THE BEST MATCHES IN ARMWRESTLING ? I have watched you armwrestle various times such as other people, and I am quite impressed. I have been pulling for 9 months, 6 of them have been with Robert Redden. I have noticed the difference since I have been training with him . I dropped 40lbs of body fat and am now pulling 176,s.but my question is, do you prefer walking on the beam or on bars, and how much weight do you do. We took a monkey bar set and cut the bars out of the middle. and we do pull-ups then we strap a weight belt on with 90 to 120 lbs then we pull our selves up and walk across on our hands then backwards with chin up. we like the bars better because you get more of a spread on the bars than on the beam like arm wrestling you know the beam works more of the finger tips but basically the same concept. Thanks for showing interest.I'm sorry I needed an explanation about walking the bars. I have never heard of that before. So I guess you can guess what my answer is on how much weight I use. Along with armwrestling once a week, my work outs are simple, mainly with machines you find in the gym. ,Although the way you explain this technique it seems like it would be one hell of a workout. Keep pulling with Robert. I believe this is were most of your armwrestling strength will come from. I was wondering if there is an advantage point when you try to hook someone if there is a difference when pulling down low on the wrist or if its better just forcing them into a hook from the normal hand to hand grip if possible. What is a stronger hook point low on the wrist or high. Thanks for helping.Yes there is an advantage to pulling someone a little lower on the wrist if you want to force a hook. The problem gripping someone with a larger, wider, stronger hand is they may be able to put your hand and wrist out of position from any point on the table. Gripping a little lower on the wrist helps eliminate a good top roller from positioning there hand to a position that will attack yours. Gripping someone lower on the wrist straight up requires a lot of hand strength and side pressure but once turned into the hook the leverage advantage is about equal. This will also help keep your hand protected once you achieve the hook position. This move requires a lot of work. Conditioning your arm to be strong with your hand and wrist straight is unnatural even for most seasoned armwrestlers. This move works for the strong top roller that hits hard to the side rolling with the thumb. It does not work well for someone that is top rolling with a hard posting movement. Build and arm length of your opponent is also a consideration for the effectiveness of this move. There is also a downside to gripping low if the match goes the distance and you want to change directions the ability to roll your opponents wrist becomes difficult. Well my question this time refers to the sweep. I believe when I first started I was doing this move naturally but I was wondering if you can tell me how to execute it properly wrist position, hand position, where the tricep lies as opposed to the pad and if you bend the wrist at all or do you try to keep it stiff as a board. Are you trying to pin with a lot of side pressure or do you try to pull to your corner. Thanks again for all your help Im not sure which direction your pulling when you refer to a sweep move? Do you mean forcing your opponents hand and arm flat while moving hard to the side? This move works great against people that dont practice this and are only strong when their wrists are curled into a hooked position. Yes, you always want to bow your wrist slightly to protect your hand and wrist even with this flat handed move. I also like to use this side pressure move with the hand slightly lower on the wrist this helps to keep your opponents arm in a straight position. This requires a lot of hand strength and strength in the small triceps on the outside of the arm. If your referring to sweeping with wrists turned in. Armwrestlers pull differently in a hooked position some with there biceps some with hand strength, triceps, shoulder, and lats. Most of the time I prefer the second method. A dragging hook is more like tug of war. Your shoulder and lat need to be flexed to keep the arm close to the body and the triceps flex to drag your opponents arm low to the table hand strength and wrist rotation needs to be superior to keep your wrist on top of your opponents. The front of your wrist should be perpendicular to the table while your defeated opponents hand faces the ceiling. Triceps not biceps should be the muscles that ache after some hard fought matches. What would you recommend for a beginner to do to get ready for his first competition, three months from now? How long have you been pulling? This tournament should be used as a learning experience or do you have a goal to place? Dont expect a whole lot unless you have been pulling for at least three years. Three months is about enough time to hurt yourself. If you have been pulling longer. I would armwrestle once a week maybe twice depending on how young or new you are in your training, while weight training at least once a week for healing. Depending on the way your tendons feel give yourself at least 1 week preferably 2 weeks of complete rest before the tournament that means no pulling and light weights if any. The hardest thing to do, is to do nothing as tournament time approaches. Most importantly pull with anyone and everyone you can after the tournament this will build confidence for the next tournament. Well I am sure everyone that reads this knows that you are ONE of the best that has ever been in the sport! But, If there was a meet, that was just a free for all! And all the armwrestlers came to compete, who in your opinion would the finals come down to! Just a straight free for all! And then who do you think would be the winner?? I have an idea of who it would be, and I want to see if we are close in our guess! I have mentioned in the past some of the people I think are the best heavyweights of the past and maybe present. I have no idea what kind of shape they are currently in or if they are even still actively pulling. But lets say for fun everyone is in the best shape of their lives for this tournament. Some of the favorites would be Cleve Dean, Gary Goodridge, Alan Karaev, Erekle Gurcheane, Jerry Caddorette, and Richar Lupkus. In my mind they are currently half a dozen guys that would be capable of winning a super heavyweight free for all tournament. The one who would win would largely depend on the draw and his ability to stay fresh through to the final matches. Would I bet all my money on any one of these armwrestlers winning the BIG ONE? Not a chance. None of these armwreslers would win without some help from the others. This time my question has to do with trying to defend against someone that has a strong posting top roll. I was wondering what I can do to try and take away some of the power that comes from him. I use a sweep to try and beat him but this seems to almost feed him my fingers. because they get pried away from me. I use the ironman grippers and can close the number 2 gripper five or six times so I don't think that my grip is weak or maybe it is, please give me as much help as possible. Defending isnt the proper technique when pulling someone with a good posting top roll attack is more appropriate. Speed at the start getting his arm at a slight angle is key to winning. People that have great arm strength and that are able to keep their knuckles high pulling straight back are very difficult to pull against the key is the start and in not letting them get that straight up and down posting position. Make sure the index finger knuckles are even at the start and both arms are at the same angle. Dont allow his posting move to lift your arm out of the cup before the start. keep your elbow back in the rear of the pad this will help put both of you at a little bit more of an angle. This sometimes is difficult because of different builds. If you can achieve that slight angle on their arm before the start it becomes more difficult for them to have that much arm strength to curl your hand and wrist to the straight up and down position. These type pullers are especially difficult personally for me to deal with. What I found works for me is coming across the table slightly to set a hook or to allow a slipped grip, go into the straps and maintain as good of a post as possible with hopes of having superior side pressure for the win. Dont forget to practice using the straps also practice side movement with knuckles high and wrist straight. Most people that use this type of move do so because their hand size and strength is not as strong as their opponents this becomes an excellent way for someone without a powerful hand and wrist to protect their own hand from being top rolled. It sounds like your hand and fingers are strong, work on your post and side pressure. I'm primarily a wristwrestler. I'm just starting to compete in armwrestling tournaments. Is there a particular armwrestling style / technique that is more suited for a person switching from wristwrestling to arm wrestling? Im sure you will do fine armwrestling if you are a wristwrestler. The grip and pressures exerted on the arm are virtually the same. The positioning of the left arm makes body movement difficult on the wrist wrestling table. I think the main thing you will notice is it will be easier to pin your opponent armwrestling. Although along with that it also becomes easier for your opponent to pin your arm. Wristwrestling in my opinion, because of the lack of body movement, requires a lot more endurance. The styles used wristwrestling can all be used on the armwrestling table. The style used should be based on your strengths and your opponents weaknesses. Practice practice practice on the armwrestling table, it will definitely feel a lot different than the bound up wristwrestling table does. Dont be surprised or discouraged if someone that you can hold or maybe even beat wristwrestling is able to beat you on the armwrestling table. They are two different races. Where wristwrestling would be like running the 400 meters in track. Armwrestling is the 100 meters. I was wondering in your option ,who you think pound for pound who the top three women armwrestlers are? Also who is the top three best women that you know of? Im sorry Cindy but it would be hard for me to begin to guess who the best 3 women armwrestlers are as I very seldom compete against any of them to gauge their abilities. I can only guess like anyone else based on what I have seen in past tournaments. And being a spectator most are from tournaments here in the United States so I may be wrong in my assumption that Dot Jones is currently the best women armwrestler? Pound for pound Im not sure? But Im sure Barb Zalepa from Canada would be in the running. My experience watching women armwrestlers from other countries is very limited and Im not sure if Dot has much experience herself in competing internationally so this is just a guess. John, how can I attach my opponents hand or fingers when he is taking a lower grip, preventing me from executing the top roll? Where do you plan to compete next? Is the World's Wristwrestling Championships on your calendar? Any help you can provide will be greatly appreciated. It becomes a lot more difficult to top roll someone that grips low on the wrist and if this persons hand strength is good enough to curl you into a hook you may have to pull there. The person who is grabbing low is giving away a little in leverage, you have to take advantage of this and develop a straight wristed posting hit to the side. This may not brake the wrist back but should keep your opponent in a most uncomfortable position and hopefully result in a victory. Practice this, you cant always rely on your superior hand strength, someone will surely figure out how to counter it. Be versatile, this style might work better for this type of set up. Yes I do plan on attending the World Wristwrestling tournament in Petaluma this year. Im planning on pulling three right and two left. John, I saw you compete at the Main Event II and was more than impressed with both your skill and sportsmanship. I am just getting into the sport (I have been to five contests now). I bought the video of the tournament to study; and noticed two things which I have questions about. 1. I noticed that, while some competitors put their elbow hard into the pad, some competitors seemed to hardly touch the pad with their elbow at all. Is their a reason, and when do you do one or the other? 2. On several of the matches the competitors seem to be pulling before the referee has even let go of the hands or said go. Why is this? I never really gave it much thought about the elbow into the pad, but I would assume it has to do with the style being used. If you are pulling across the table with your tri and lat and holding your opponent down with hand strength the elbow would be hard into the pad. Verses posting up using biceps and knuckles high to gain finger advantage then your elbow would float and sometimes is purposely lifted to gain a higher finger advantage. Some people feel more comfortable with a little or a lot of load on there arm before they actually hit to the pad or before the go. Some people do not care to load at all and would rather hope to catch there opponent off guard after the go, different style and strategy. My preference is to be ready with only a very slight load. You need something to be able to react to your opponents movement/direction but you dont want to be loading to hard before the go for to long, because obviously this require a lot of energy and can take a lot of the edge off your arm for latter matches.